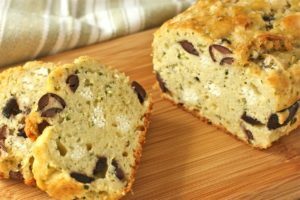 This gluten-free and dairy-free loaf is the perfect savoury snack to share! Whisk the eggs and add the salt, vinegar, olive oil. Add in the almond flour, buckwheat flour and baking powder to the egg mix. Add in the chopped rosemary, olives, garlic and chilli flakes. Bake for 45-50 minutes or until golden brown and knife comes out clean. Serve warm or keep in fridge for a few days.